Print out our Calendar of Events so you don’t miss a thing! Join our mailing list to receive notice of events on our Calendar and other local historic opportunities. • CONVERSATIONS AT THE CROCKER: Our most popular gatherings… A series of interactive panel discussions on events that shaped Sarasota County’s past and continue to exert influence on its present and probably the future. These monthly events run from October through April. These events start at 7pm in the Crocker Memorial Church. They are FREE to Historical Society members and $10 at the door for nonmembers. Bring your friends and participate in lively and informative discussions. Bidwell-Wood House is open beginning at 6pm for touring before the meetings. If just 2 or 3 meetings in our season intrigue you, you might as well become a member. Besides, we love members! We also can host private tours for groups up to 30 participants; call us at 941-364-9076 or email us at hsosc1@gmail.com for details. Grab a seat, enjoy the Bay, hear some local stories, and help the Historical Society preserve Sarasota’s past! HISTORICAL BAY CRUISE aboard LeBarge: Our traditional November Historical Society Bay Cruise is an expert-narrated cruise in beautiful Sarasota Bay. Learn who lived here; why Sarasota is unique on the west coast of Florida, and how the Bay of Mexico and the gentle bays surrounding us have formed a town unlike any other in Florida. 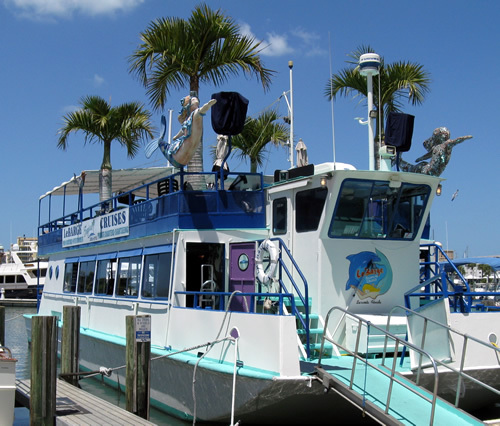 Learn local history and enjoy our beautiful bay on our Historical Cruise on Sarasota tradition, Le Barge. Throughout the year, we have special events, concerts, tours and cruises, so be sure to join our mailing list to get first dibs on activities as they become available. in Pioneer Park, 1260 12th St., (just east of Tamiami Trail, just west of Cocoanut Avenue), Sarasota FL Open 10 – 2 Monday – Friday Private, guided tours and rentals welcome and help us preserve, protect and polish two of the oldest buildings in our county.